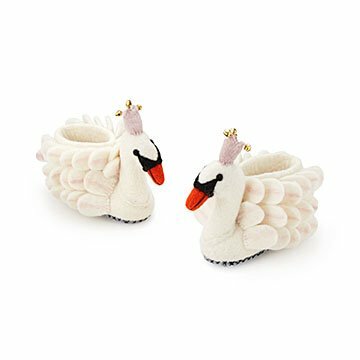 These handmade swan slippers give the royal treatment to your little princess. Swans are traditionally a symbol of royalty, and nothing less could be expected for your little princess. Let her imagination take flight with these enchanting slippers, which are hand-felted by artisans in Nepal using organic wool, soap, water, and some skilled knowhow. The embroidered details on the crown and individual feathers make them a fairytale treasure. Handmade in Nepal. See details tab for sizing information. Spot clean with cool water.